Home / In The News / Grassroots Resistance is Alive and Well! Grassroots Resistance is Alive and Well! A week ago today, we witnessed a long-anticipated threat to social and economic justice coalesce into a victory for people power. Last Friday the White House and Congressional Republican Leadership failed in their attempt to gut the Affordable Care Act. Amid escalating threats from the Trump Administration—not to mention seven years of misinformation, over fifty proposed bills, numerous largely unsuccessful legal challenges and millions of dollars in lobbying to eliminate the ACA—Speaker Ryan failed to wrangle the votes they needed. The proposed bill to repeal Obamacare would have eliminated health coverage for an estimated 24 million Americans while handing tax breaks to the wealthiest Americans. On top of it all, it would have kept intact profits for insurance and big pharmaceutical companies at the direct expense of affordability for patients. Congressional Democrats unanimously opposed the measure. Far-right conservatives did so as well because the legislation did not go far enough in reducing health care funding for lower income Americans. More moderate Republican Congressmembers also opposed the measure, ultimately ensuring its failure. The ACA was a landmark advance for economic justice, furthering the vital social value that people should have health care regardless of their income or preexisting conditions. Now it seems the challenges ahead will include a more insidious effort to thwart Obamacare by a slew of executive actions intentionally aimed at undermining its success. Meanwhile, progressive leaders are gearing up to introduce greater expansions to healthcare. Locally, we have been fortunate to have significant support for expanding access to healthcare. In this fight over the future of the ACA, we saw highly-effective grassroots phone and email advocacy efforts across Santa Barbara County. These groups lobbied key members of Congress throughout the country—local groups such as the newly-galvanized chapters of Indivisible, the Santa Ynez Valley Community Action Alliance, the recently-reignited Progressive Coalitions in North and South County, as well as long-established organizations such as Planned Parenthood, Health Care for All and others. These groups, among many more, organized and joined hundreds of concerned community members. They held informational sessions around healthcare policy, organized phone banks, letter-writing sessions and more. Congressmember Salud Carbajal hosted town hall meetings on the subject throughout the 24th Congressional District with each event turning out hundreds of stakeholders. 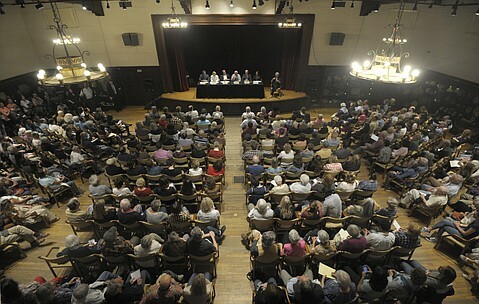 Paul Wellman, Santa Barbara Independent 3/16/17 Congressman Salud Carbajal hosts standing room only town hall meeting to discuss possible effects of House Republican’s health care plan to repeal and replace the Affordable Care Act at the Santa Barbara Museum of Natural History’s Fleischmann Auditorium. It’s important we recognize that here in our region we have a long, rich history of advocacy expanding access to quality healthcare for everyone. Groups such as these and many others across the nation are diligently tracking health care policy and beginning efforts to help shape legislation to improve the ACA. Others who have been working on these issues for decades, such as Healthcare for All, are seeing this as an important moment in building momentum behind a single-payer, or Medicare for all, system for California. Just today, the CA State Legislature officially published the initial text of SB 562 (Lara/Atkins), The Healthy California Act, which you can read here. Yes, we have many more fights ahead of us. And we must remain strategic and steadfast in our values. Let us learn and draw strength from this victory and others to come as reminders that our strength and perseverance lies in the relentless action of people speaking truth to power. We want to hear from you! Please keep us updated on your local efforts around expanding access to healthcare.